This bread is so good right from the oven with a little sweet cream cheese on it. You can top with vanilla icecream and carmel sauce. fold in the about mixture , you can add nuts or raisins if you like. I use 1/2 c. walnuts. Bake in loaf pans at 350 degrees for about t 40-50 minuets till center is firm. 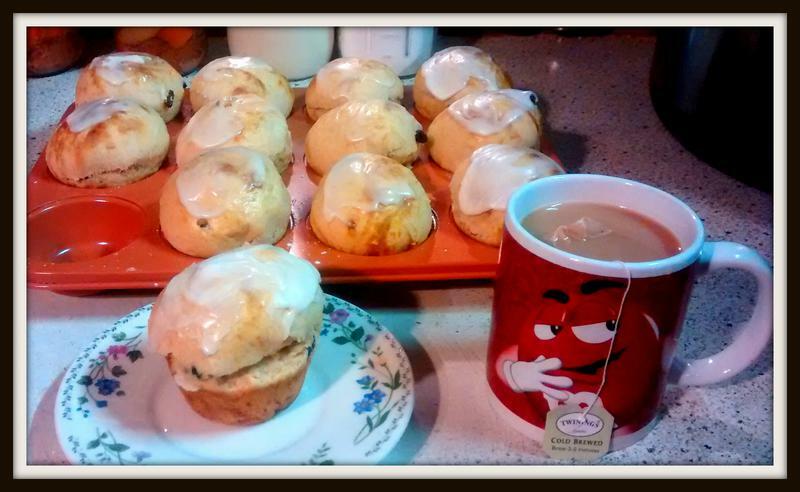 Sweet cream cheese spread, mix 1/2 can vanilla frosting with 1 pk cream cheese, whip well and serve with the bread. Sift together 3 times the flour, baking powder, salt, cream of tartar, sugar and dry milk. Cut in shortening with pastry blender or 2 knives until mixture looks like coarse corn meal. Store in covered container at room temperature. Makes 13 cups mix. Note: To measure the Master Mix, pile it lightly into cup and level off with spatula. Use just like bisquick but much better. Mix master mix with enough water to make a soft dough. Roll out thin and top with your favorite veggies and cheeses. This is a spinach, onion and Fetta cheese pizza. It's quick and taste so good! Have you ever wondered why the food that came out of your grandmother's canning jars tasted so good? She knew the secret of preserving the fruit and vegetables as soon as they were picked. Grandma canned fruit, jams, jellies, sauces, pickles and relishes. If anyone wants to know how to put up tomatoes then just email me and I will send out the instructions. Yes, it is really easy if you follow just a few easy steps. First clean jars, get out the new lids, your produce and a large canner. I love using my slow cookers to let my sauces cook for a long time making them into rich tomato sauces to be used in soup, stews and on pasta. Here are a couple of pictures to get you motivated and to show you some of the different products you can put into jars for the winter. Enjoy your summer garden all year long! The two boxes of tomatoes were a gift to me this spring. I made 20 pt's of sauce from them. On the wood stove is: relish, sauce, green beans, spicy sauce, raspberry zucchini relish, apple sauce, cranberry apple sauce and more hot sauce. Yes I do use the wood stove in the winter and it makes awesome soups. 4 prepared 8 inch pastry shells , recipe on the bottom of instructions. Preheat oven to 350 degrees F (175 degrees C). Beat together the cream cheese and the sugar, add the pumpkin and the spices. Beat in eggs one at a time. Add salt. Beat until creamy. Pour the batter evenly into the two crusts. 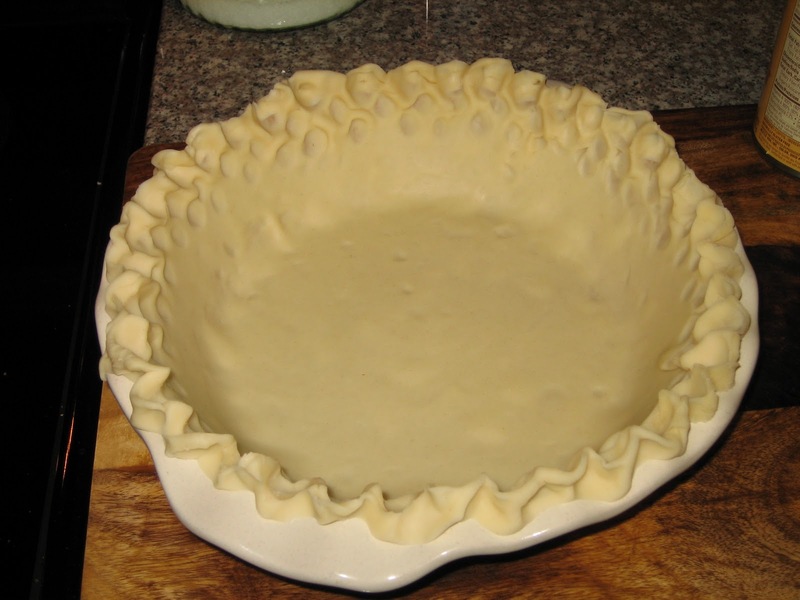 Crust for 2 pies, 3 c sifted flour, 1 tsp salt, mix in the salt, 1 ½ C Crisco butter flavored shortening. Cut in the shortening till it looks like the size of peas. No here is what makes the dough soft and easy to work with. Fill a 1c. Measuring cup with luke warm water. Make a well in the center of the flour and pour in ½ the water. Gather up your first ball of dough and then repeat with a little water at a time till you get all the flour mix incorperated in to balls. They should be soft but now sticky. Take one ball of dough and roll out onto a floured counter. Place in the pan and scallop the edges, prick the crust with a fork ,brush with egg wash , it will keep it from getting soggy. Bake in the oven 10-50 min till the crust sets. Pour in batter and back till the top is no longer shinny and the crust is golden brown, remove and let it cool before cutting pie. 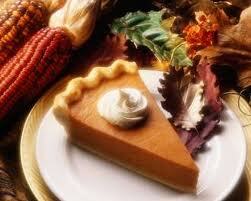 This is wicked creamy pumpkin pie! 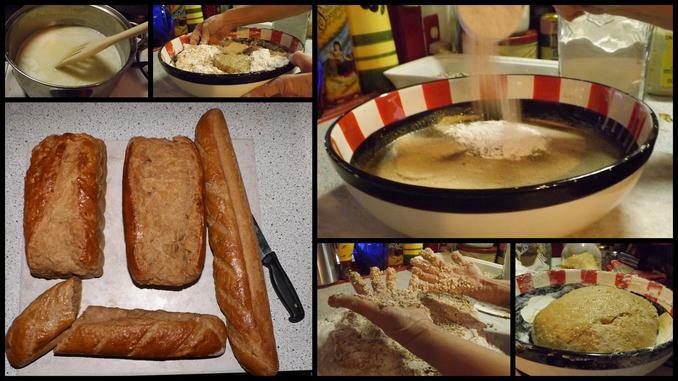 Today's bread with instructions! Sourdough Amadama bread! First get a sauce pan add 1 cup cornmeal and 2 c. water, 1/2 c. molasses, 1 tab salt, 1/2 stick butter. bring it to a boil and let it get thick. Put the cornmeal mash in a... large bowl and add 1 Tab black cocoa and 1 C. cold water. Now add 2C. flour, 1 rounded tab yeast and your sourdough starter and beat it well. Once it looks sticky add 2 more C. flour and mix well. On the counter put 3 c. flour and drop the mix into the center and start kneading it into the dough.. Once it is mixed well and looks nice and firm and smooth, place in an oiled bowl. Oil the top of the bread and cover loosely with a hot wet bread cloth. Let rise! Put it on the counter with flour under it and this should be cut into 3 equal pieces and shape into loves. Put in sprayed pans and let rise again, brush with egg wash and make slices on the top. Bake in a 350 oven till the top sounds hollow and is nice and golden brown. About 30-45 min. Take it out and place the bread pan on it's side till cool. It will smell like beer when it is ready. Make sure you stir it every day. This gives the bread a nice spongy texture. Special credit to my 10yr old grand daughter who took all the pictures for me. We have a budding photographer! What's cooking in Elly May's kitchen? Home tested recipes to make for your family. KIM CHI Here is what I did. Napa cabbage about 4 lbs cut up and salted with 1/3 c kosher salt. Let it sit till it wilts. About 2-3 hours. Lightly rince of some of the salt put it into a large bowl. Take 4” piece of ginger cut up and put it into the blender with 1 cup water , blend well, strain and squeeze out the juice, trow away the stringy stuff. 3 huge cloves garlic or at least 6 regular size. Whip it up pour over rinsed and drained cabbage . I SAVE SOME OF THE RINCE WATER IN CASE I NEED IT. You will need at least 1 large bunch of scallions cut at an angel, mix in. If you add scallops cut them up a bit, they are nice. Let this set a while and check on liquid, you may need to add another cup or two of saved water later. Weight it down and walk away. Next morning you can put it in to jars if you like. Loosely cover the jars. Taste, when it hits your tongue it should first taste salt, then the garlic mix and last the bite. If you feel it needs more salt add one spoon at a time, let it sit then re check. 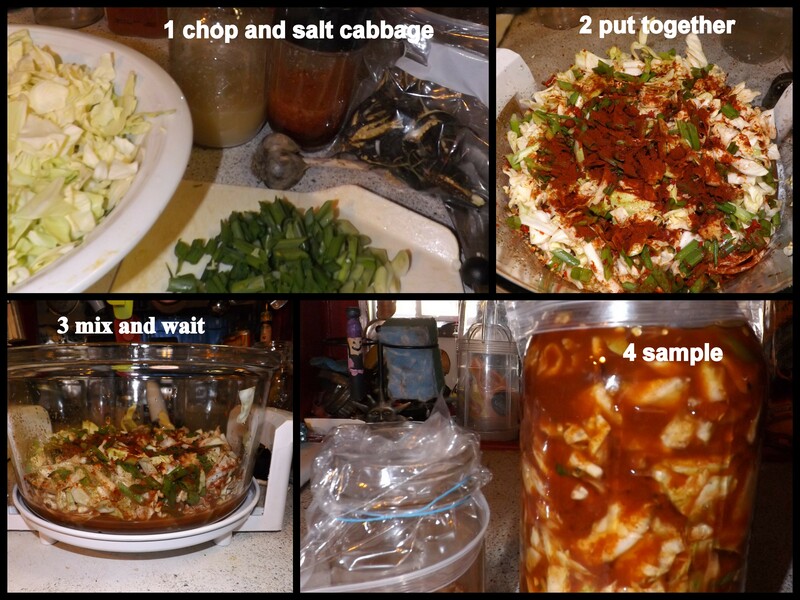 If too salty a more cabbage, again a little at a time till it is adsorbed. It stays on the counter for about a week before it goes into the refrigerator. Liquid will cover the veggies. Good luck. Coat a large bowl with oil and set aside. Combine the 1 cup milk, yeast, and the 1 teaspoon sugar in a small bowl and let stand until bubbly. Combine the flours, remaining sugar, raisins, zest, salt, and spices in the bowl of a standing mixer fitted with a dough hook (or in a large mixing bowl) and mix on low speed. Add the butter, 2 eggs, and the yeast mixture and continue to mix until a sticky dough forms—about 3 minutes. Transfer the dough to a lightly floured surface and knead by hand until smooth—about 5 minutes. (If dough has been combined by hand, increase kneading time to 10 minutes.) Form the dough into a ball, place it in the prepared bowl, and turn to coat all sides with oil. Cover with a clean, damp kitchen towel and let rise in a warm, draft-free place until it doubles in volume—about 1 hour. Line a baking pan with parchment paper and set aside. Punch the dough down, transfer to a lightly floured surface, and knead for 3 minutes. Divide the dough into 12 equal-sized pieces—about 3 1/2 ounces each. Shape each piece into a ball and place the balls about 1 inch apart in three rows of four on the prepared pan. Cover and let rise until the buns double in volume and touch one another—about 1 1/4 hours. Preheat oven to 500°F. In a small bowl, combine the egg yolk with 1 tablespoon water. Using a pastry brush, lightly brush the mixture on the top of each bun. Place buns in the lower third of the oven and reduce oven temperature to 400°F. Bake until golden brown—about 20 minutes. Transfer to a wire rack. 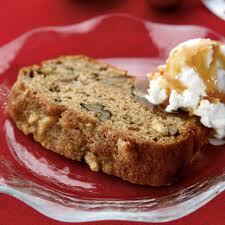 In a small bowl, combine the confectioners' sugar, remaining milk, and vanilla. Stir until smooth. When buns have cooled slightly, drizzle a horizontal line across each row of buns followed by a vertical line to form a cross on the crown of each bun.